Postering in the Castro yesterday I ran into Glitter Emergency star Martyn Garside and was happy to be able to hand him a copy of The Bay Guardian with our picture in it. He handed The SF Weekly right back to me. I hadn't seen it and had no idea it was getting written up. In the paper edition, my head is so big it blots out the "Night & Day" masthead, and part of the sky, and doesn't fit on my scanner (insert ego joke here). Tonight is the last night of my 30s and James has already imposed a moritorium on milking that particular tragicomedy. It is also the premiere of The Glitter Emergency and to that end I need to stop typing so my hand will last through the Tchaikovsky. True to the spirit of the Peg-Leg Ballerina, I'm going into tonight's performance feeling a little wobbly, physically, but an hour on Michael Soldier's massage table this afternoon should shore me up. So here I am, signing off on the last blog post of my 30s. 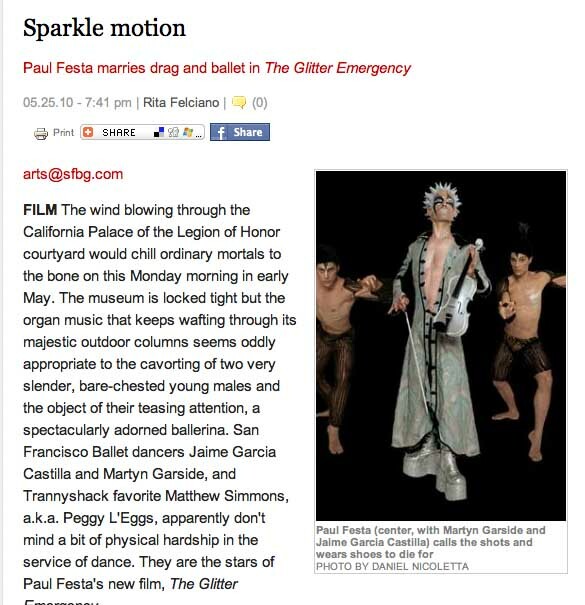 Come celebrate Glitter, and 40, tonight at supperclub - screenings at 8, dancing from 10 to 2. I've hired a Pink Mammoth DJ to get me over the threshold and I'm saving you a booty shake. 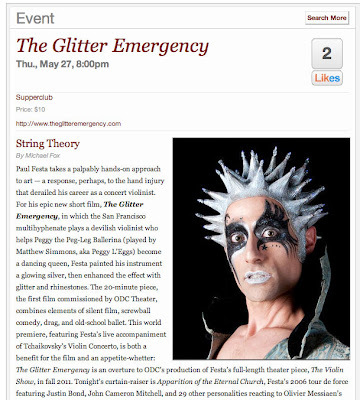 The Glitter Emergency premieres in two days - on Thursday, May 27th - a day after the Bay Guardian's video issue comes out and no I didn't plan that. Nor did I make a ballet film to give the Guardian's dance writer an ideal subject for the video issue, just as I didn't intentionally make Apparition of the Eternal Church on the eve of the Messiaen centenary. You could hate me for having good timing, or you could look at Thursday's weather report. Though Glitter shimmers with rhinestones, confetti, and silliness, like a lot of ballets, its heartbeat is steady and strong. "Do not turn away from the magic inside you," exhorts one of the film's copiously strewn-about subtitles to which our Cinderella responds with the longest batting eyelashes ever seen on a would-be princess.